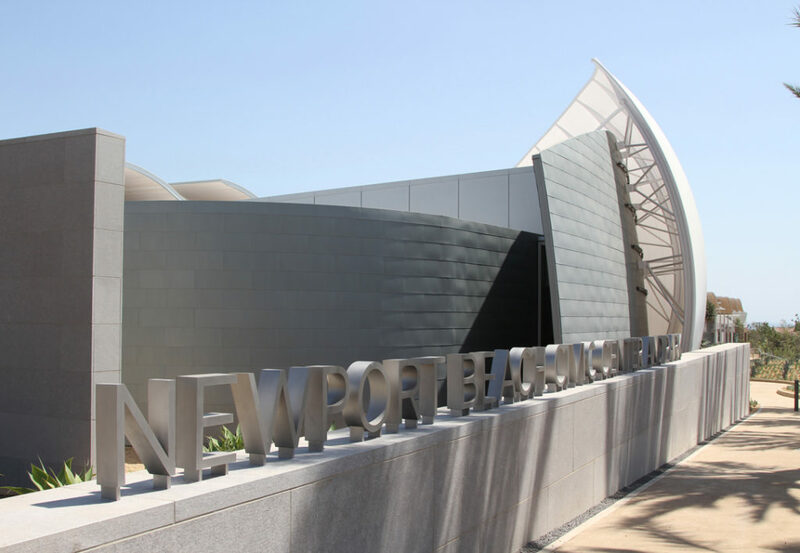 Whether it’s a new build, major renovation, or moderate upgrades, being awarded a convention center project can be a big deal for architecture firms – both big and small. So, it’s essential for your bid to find the ideal balance between visual impact and functionality, cost-efficiency and long-term performance. Increasingly, architects are turning to tensioned membrane architecture to achieve their projects’ requirements while making the most of their clients’ resources. Here are just some of the ways tensioned membrane architecture is ideal for convention center projects. Due to the strong yet lightweight nature of the PVC or PTFE membrane, tensioned membrane architecture opens a world of opportunity for creating large expanses of “rooftop” with minimal support. This can be ideal for exhibit halls or event spaces – which are most functional when designed without (or with minimal) support columns. When it comes to lighting large spaces, tensioned membrane rooftops add functionality and reduce energy costs by maximizing the power of natural light. The membrane diffuses sunlight – protecting the interior from harmful UV rays while still maintaining the beneficial glow of natural light. The color of the membrane can help you maximize or minimize light exposure, depending on the project requirements. Parking garages, lots, and other structures are a necessity for every convention center, but they’re not generally celebrated for their artistic contribution to the site. With tensile facades and tensioned structures, you can transform parking facilities from utilitarian designs into visually appealing and functional spaces. 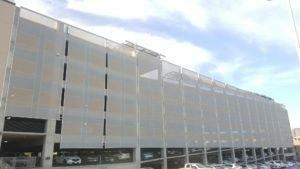 Tensioned membrane architecture provides solutions to challenges such as protecting vehicles, maintaining open-air classification, maximizing energy usage, improving aesthetics, and reducing light pollution. 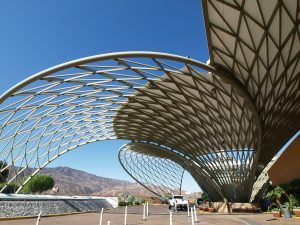 When it comes to cost-effective options for adding truly unique style to a convention center renovation (or new build), tensioned membrane architecture unlocks exceptional flexibility. Artistic free-standing or canopy designs can make iconic entryways. 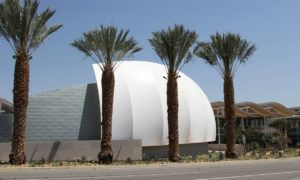 Tensile facades can add color, texture, or branding. LED lighting can create extraordinary nighttime effects. The options are only limited by your imagination. Regardless of whether it’s a new construction or a renovation, it’s likely that the project has a significant focus on maximizing energy usage, minimizing environmental impact, and incorporating new materials to overcome energy-related challenges. Among its many performance benefits, strategically designed tensioned membrane architecture can help to naturally cool a building’s interior by 10-15o simply by shading the exterior – a savings that you’ll certainly highlight for your client. In many cities, convention centers are more than indoor spaces. Outdoor areas are often used for open-air seating, informal breaks, or as more formal event venues. 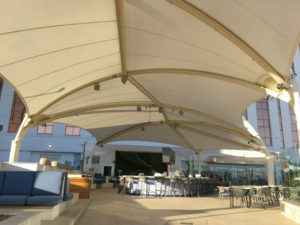 By adding shade and rain protection, tensioned membrane architecture creates more comfortable, more functional, and more inviting spaces throughout the property grounds. 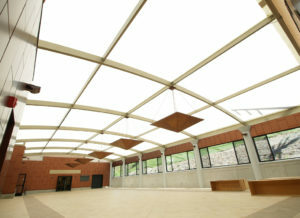 Read more about how tensioned membrane architecture can help to Create a Gathering Space.